Video-conferencing should provide a complete simulation of a normal meeting environment, enabling both parties to see, hear and present material, just as if they were in the same room. Videoconferencing can speed up business process and procedures in the same way that the fax and the e-mail have revolutionized the way we share information. Audio Visual Effects is dedicated to the videoconferencing market, as such we offer a complete video conference service, one that is manufacturer independent (Polycom, Tandberg, Sony, Radvision, Aethra and others). The use of video and collaborative tools is growing and changing, the technology is now at a point that it will astound you; the benefit from such technologies is HUGE and now is the right time to invest or revisit your existing usage. Tangible benefits are most easily related to actual cost savings. The most obvious quantifiable saving is the cost of travel and the cost of the time wasted during travel. Videoconferencing is not a replacement for every meeting. By installing videoconferencing you then have the choice which meeting you physically attend, or hold over a live video link. By substituting 35% of your physical meetings with video meetings you will immediately recoup the cost of the equipment installed at three independent locations. Videoconference meetings will have an instant impact on your bottom line, saving your company considerable costs, time and stress caused by the over congested roads and infrequent public transport, which over the next five years is predicted to increase by 20%. The increase in your productivity, because of the time saved, will allow more funds to invest in your employees or business expansion. 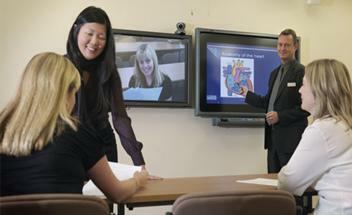 In addition, videoconferencing is a vital daily business tool. It can form an integral part of your company's disaster contingency plan, allowing your business to continue functioning even in crisis situations. You can still communicate with your prospects & clients, retaining your advantage over your competitors.